It's been an extraordinary week. We've watched the first African-American president give his acceptance speech to a crowd of thousands in Chicago, watched him give his first press conference as President-elect, and watched our country's reputation rebound across the globe, as America finally seemed to do something right in the eyes of the rest of the world. There were definite downs to the week, as well: the state of California voted in favor of Proposition 8, effectively banning gay marriage across the state and stripping thousands of a right they had just been given months before. With so much emotion, elation, and heartache in just a few short days, it's hard to properly wrap this week up, as our country has taken steps forward and backward, all at the same time. 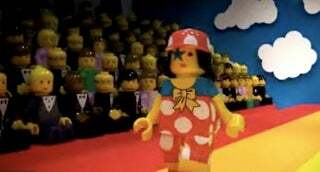 And so, in order to provide a general stress release for everyone, let's end this Sunday night with the help of this amazing Lego Fashion Show, which shows Lego people of all shapes, colors, and styles coming together on a bright rainbow catwalk. Video after the jump.